For many audio processing operations, it is necessary to control and modify in an independent way both the time evolution and the pitch contour of an audio signal. Slowing down or speeding up an audio signal without altering its spectral content is referred to as time-scaling. 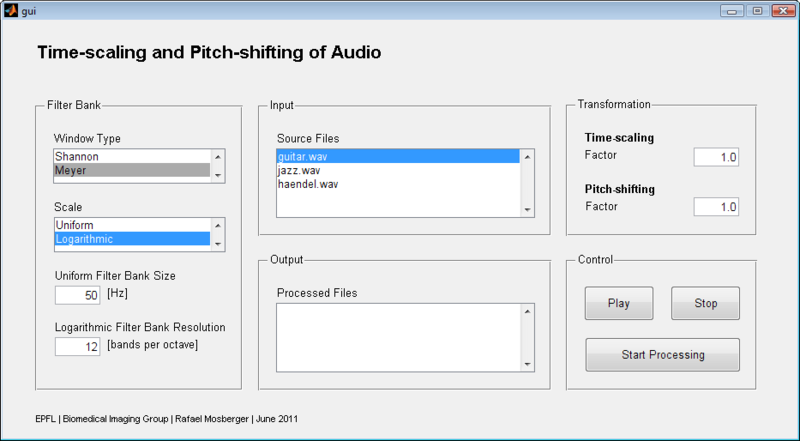 Contrarily, the modication of the pitch of an audio signal without altering its duration is referred to as pitch-shifting. The algorithms developed during this project perform the time-scaling and pitch-shifting operations using an analytic signal representation of the audio sample to be processed. The analytic representation combined with a filter bank allows the input signal's decomposition into its components and to identify each componentÕs instantaneous amplitude and frequency. Simple signal processing operations as multiplication and dilation are then applied to these two signals in order to perform the desired operation before the output signal is reconstructed.